Make every performance an event to remember and be sure that everyone can see the stage when they stand upon collapsible Risers. A Stage platform can be set up and taken down in no time. 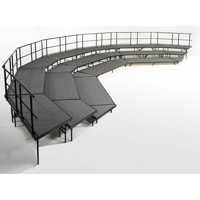 Surround the collapsible stage with platform risers. Be safe with Guard Rails for the back of a stage or the stage sides. Allow plenty of standing room with removable risers and movable stages that can be readjusted and reshaped! Set up the stage with Audio Equipment to be sure everyone can hear what is going on. Set up some Lecterns or a podium for public speaking. Set up any other Visual Equipment needed and you�ll have a Spotlight worthy show in no time!